Satie was an eccentric joker with a rebellious spirit and often made fun of classical music by composing parodies with unusual titles like Unpleasant Glimpses, Desiccated Embryos, Genuine Flabby Preludes (for a dog), Old Sequins and Old Breastplates, and Teasing Sketches of a Fat Man Made of Wood to name a few. Satie was good friends with Claude Debussy and Maurice Ravel, even though he opposed impressionistic music - a genre in which Debussy and Ravel composed many great pieces. 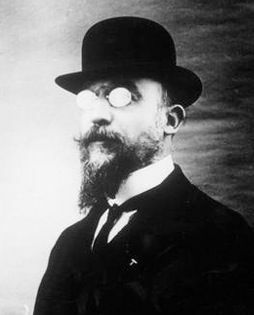 Satie was known to habitually walk across Paris proper every working day; a round trip of roughly ten miles. Erik's father, Alfred, was a skilled pianist and musician, but little is known about his mother, Jane Leslie. The family, along with Erik's younger brother, Conrad, moved to Paris, France when the Franco-Prussian War began; Erik was five years old. Sadly a year later in 1872, his mother died. Soon thereafter, Alfred sent the two boys back to Honfleur to live with their paternal grandparents. During this time, Erik began taking music lessons with a local organist. In 1878, Erik's grandmother drowned mysteriously and the two boys were sent back to Paris to live with their newly wedded father and step-mother. Erik and his step-mother, Eugénie Barnetsche (a composer, pianist, and music teacher), did not get along. She enrolled Erik into the Paris Conservatory, but despite his disdain for the prep school, he continued to stay in order to avoid military service. Erik was so disinterested with his studies, his laziness was the cause of his dismissal in 1882. Outside of school, Erik continued to study music but was drafted into the military in 1886. Crafty Erik, however, purposely contracted bronchitis; he was released from service several months after being drafted. While Erik was "studying" at the Paris Conservatory, his father had started a music publishing firm. After Erik's military discharge, he moved to Montmartre, a bohemian district of Paris, and quickly took up a musical residency at the Chat Noir cabaret. In 1888, he wrote a few pieces for piano that were published in by his father - the now famous, Trois Gymnopedies. It was at Chat Noir that Erik met Debussy and a handful of young "revolutionists." Debussy, perhaps the better composer, later orchestrated Erik's Gymnopedies. These early days of performing and composing brought Erik very little money. While in Montmartre, Erik joined a religious sect called the Rosicrucians and wrote several pieces for it, including Rose et Croix. Later, he began his own church: the Metropolitan Church of Art of the Leading Christ. Of course, he was the only member. He spent a great deal of time writing literature about art and religion and even applied to the prestigious Académie Française - twice. Stating something along the lines that his membership is owed to him, he was denied. After composing Messe des paupers, Erik inherited some money and purchased a handful of velvet suits, dubbing himself the "Velvet Gentleman." Once Erik's funds diminished (and quickly, I might add), he moved into an even smaller apartment in Arcueil on the south side of Paris. He continued working as a cabaret pianist and would walk across the city every working day. Despite his later hatred of cabaret music, it paid his bills for the time being. In 1905, Erik began studying music again - this time with Vincent d'Indy at Schola Cantorum de Paris. Erik, now a serious student, did not abandon his beliefs and composed music that went against the grain of romanticism. Erik received his diploma in 1908 and continued composing music. In 1912, thanks to his successful friend, Ravel, interest in Erik's early work, especially the Gymnopedies spiked - even more so when Debussy orchestrated them. Erik, though flattered, was upset his new works were going unnoticed. He sought out a younger group of like-minded composers, which later became as known as "Les Six." These admirers gave Erik credibility to his musical cause. He quit the cabaret and began composing full-time. He wrote a number of works including the ballet, Parade, in collaboration with Pablo Picasso and Jean Cocteau. In 1925, Erik died of cirrhosis of the liver after years of heavy drinking.